Six feet tall at age 11, the middle child of five in the tough Southside Chicago neighborhood of Woodlawn, Sheldon Smith distinguished himself early on with his capacity to lead, though not always in the right direction. As a pre-teen, Smith was recruited by Joseph Strickland, a Woodlawn native and University of Chicago graduate student working in the community, and asked to join MAGIC, a new youth empowerment organization. 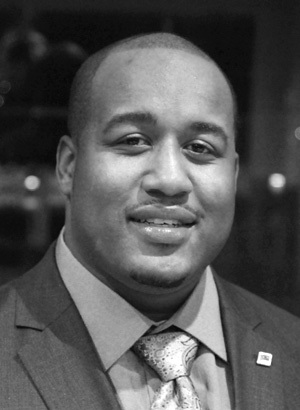 Mentored by Strickland, Smith mastered public speaking and outreach skills and embraced the idea of improving his community by building the power of its residents. At 13, Smith gave his first speech on youth rights and employment before a crowd of 500. On the surface Smith appeared to be a sterling example of a teenager who was overcoming the poverty and violence of his neighborhood, but deep down he was more conflicted than he let on. Despite everything he knew about the consequences of crime, Smith was arrested at 17 as an accessory to an armed robbery. Six months behind bars gave him plenty of time for reflection. When he was released, he managed to graduate from high school on time with a certificate in carpentry. Smith went to work for the Black Men and Boys campaign, a multi-city initiative focusing on the prevalence of under-education, unemployment, poor health and mass incarceration and he learned that 64% of African-American children grow up without a father. With his knack for articulating how these issues affected him personally, he became MAGIC’s lead youth organizer. In 2009, Smith’s baby daughter was born. “As soon as I had a child, I realized that what’s important is that the parent takes full responsibility.” His experience as a new father at 20 inspired Smith to create The Dovetail Project, a program to teach young black men the parenting and life skills they never had a chance to learn. Smith uses his organizing experience to recruit young fathers with a pledge to get them through their GED and into a productive job if they stick with the program. Breaking down their prideful posturing with no-holds-barred exchanges of sometimes painful truths, Smith guides the men through a 12-week curriculum on topics ranging from felony street law to methods for disciplining toddlers in positive ways. Dovetail quickly attracted the attention of the press, academics and community activists. Smith has consulted in New York on Mayor Bloomberg’s comprehensive public-private Young Men’s Initiative and he was selected to be one of 21 participants from 16 nations chosen to discuss innovative strategies by the International Youth Foundation. Though he realizes the challenges he’s working on are global, Smith is keeping Dovetail local. He’s looking for more partners willing to employ his graduates, working with the Chicago Housing Authority to find safe, affordable apartments for his young dads and their children, trying to get a Dovetail program started in a local high school with a high rate of teen fathers and hoping to translate the Dovetail curriculum into Spanish.